It is dark in the bacon chamber of the fortified church in Agârbiciu. Bacon has not been stored here for a while but the numbered hooks on the ceiling timbers are still witnesses of the times when families came here daily to cut off a piece – of course making sure that the stamp was placed correctly in order to guarantee that nothing was stolen. The former use of the chamber is also visible on the walls: the salt that preserved the bacon has lefts its traces on them, creating large holes and leaving the frames of the windows bare around the edges. But salt is not the only enemy of theses historic sites: rain from above and dampness from below are also threatening the buildings – the element of water is a great issue in Agârbiciu. But the future is looking bright for the fortified church”Șapte Brazi” in Agârbiciu: it is one of three projects for which not only financial aid for restoration is guaranteed but which will also profit from special expertise. In the past few months the ”hometown community” (HOG) has been able to collect donations of over €8,000 for restoration purposes and additional project money from the American Ambassadors Fund for Cultural Preservation (AFCP) will support further measures. 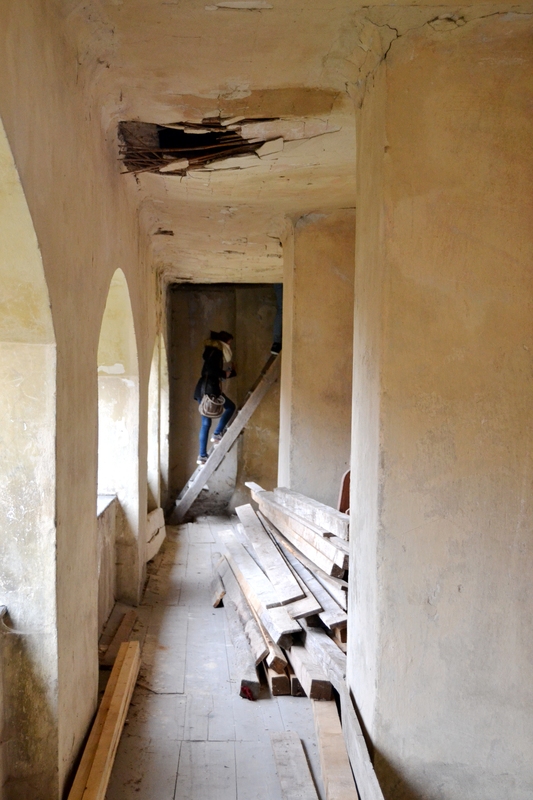 The Fortified Churches Foundation was able to enter a cooperation with the ”Ion Mincu”-University and its Professor Liviu Gligor for which starting in 2017, students of conservation and restoration from the faculty of architecture in Sibiu will be accompanying and supporting the restoration measures in Agârbiciu, Daia and Movile. How these plans can best be realized and what the details of the endeavour are were the topics of today’s excursion. 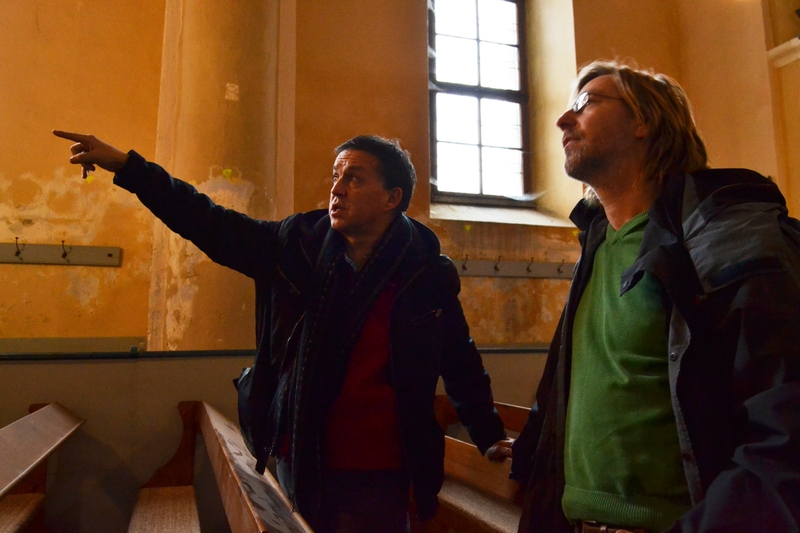 The students were confronted with the buildings and their history and Liviu Gligor and Sebastian Bethge, representative for monument preservation of the Fortified Churches Foundation answered detailed questions concerning the objectives. 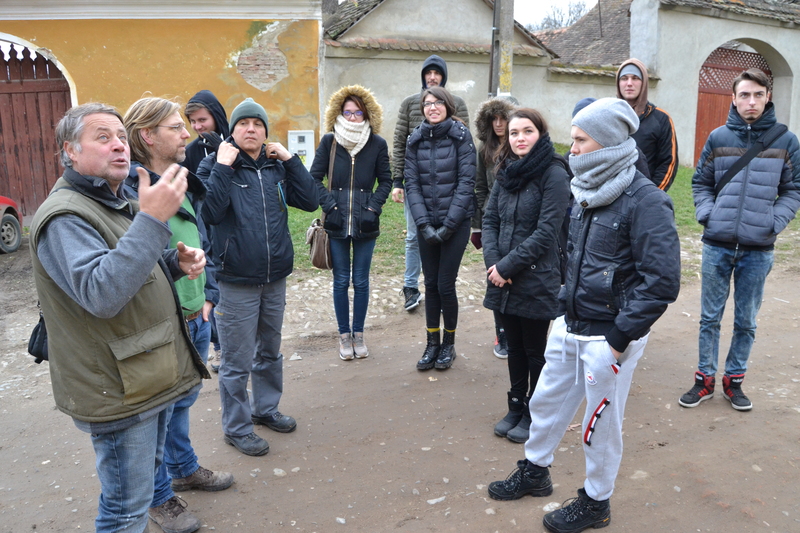 After leaving Agârbiciu the group visited Daia, near Sighișoara. Here we met with Uwe Hann, founder of the association ”Șapte Brazi” which has set itself the goal of preserving the fortification. As different as all of these fortified churches are architecturally (here in Daia the solemn tower is one of the special features), as different is their situation in the respective communities and their cooperation with initiatives and organizations – another fact that is brought to the student’s attention on this trip. After a short break with coffee and cake in Apold the last stop leads the group to Movile. Because of the early sunset the interior of the church has to be inspected with flashlights and there is no more time to climb up the tower to look over the unique landscape of the area. A long day has come to an end and has left many special impressions. One thing can be said for sure: there is much that needs to be done! The nicer it is to know that the cooperation will be profitable for all sides including the students who will be able to gain practical first-hand experience working with fortified churches.